Oh, Palm Grove... where to even begin? 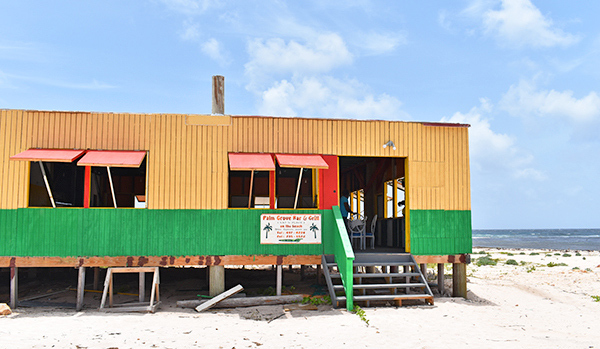 Our love affair with this sandy beach shack runs deep. 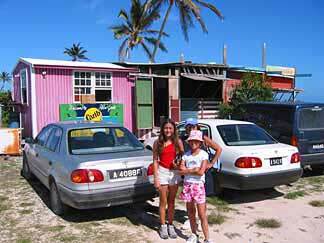 It all began on our first visit to Anguilla in March 2002. Thirsty and starving after a long day of exploration, my Dad and I stumbled upon a colorful little beach bar on Savannah Bay/Junk's Hole. 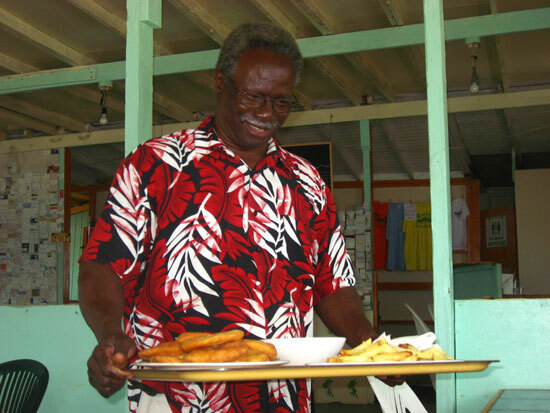 To this day, that quiet meal with my Dad, with the gentle waves of Savannah Bay in the background, remains one of my favorite experiences at any of Anguilla's restaurants. We split the lobster and crayfish combo, along with a rum punch for my dad (two actually), and a Coke for me. We licked our lips as the owner, Nat approached with the oversized tray. No doubt about it, this was the best meal we had during that trip! And that includes some meals at super-expensive, 5 Star Anguilla restaurants like Blanchards and Mango's. 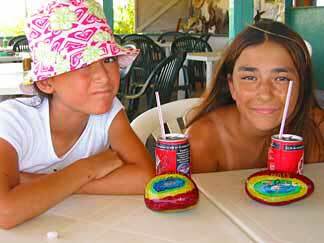 My sister and Mom had been sick that day. So naturally, they were eager to try this "best of all Anguilla restaurants" once my Dad and I returned to the villa later. The whole family was back at Palm Grove within the week! Nat actually remembered us, welcoming us back. How Was Our Second-Ever Visit to Nat's? My Dad went with a rum punch (of course) while the rest of us had Cokes. Since I had to continuously remind Dad to drive on the left side of the road after two rum punches last time (heh heh), he stuck to one this time. And we placed our order for the succulent delicacies from the sea. She doesn't like lobster and crayfish. My Dad caved in and ordered the chicken for Yuki, while the rest of us split six fresh crayfish and a five pound lobster. Straight from the sea, we saw the fisherman deliver our dinner, live. Once in Nat's hand, Nat boils his lobsters to seal in the juices. Then he BBQ's and spices them to perfection. 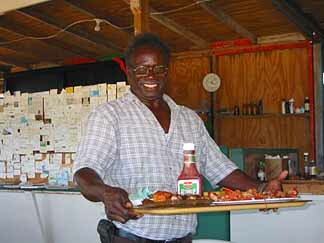 Despite the anticipation, waiting for lunch at this best of all Anguilla restaurants, is easy. 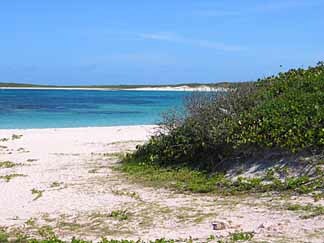 A brisk sea breeze continuously refreshes and the view encourages relaxed daydreaming. After indulging in an Anguilla daydream, Nat approaches. ... and we all lick our lips! On our first trip to Nat's with the whole family, everyone became fans! 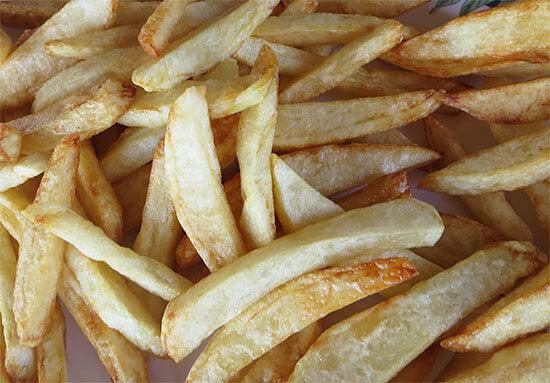 Mouthwatering food yet again. 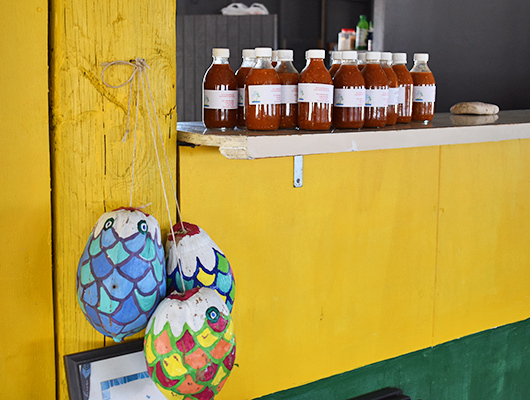 Nat makes his own special hot sauce which adds even more zest to the experience. Since then, each visit back has been better than the last. Today, Nat's building takes full advantage of the natural beauty that surrounds it. The cooling sea breezes unapologetically enters through open windows. 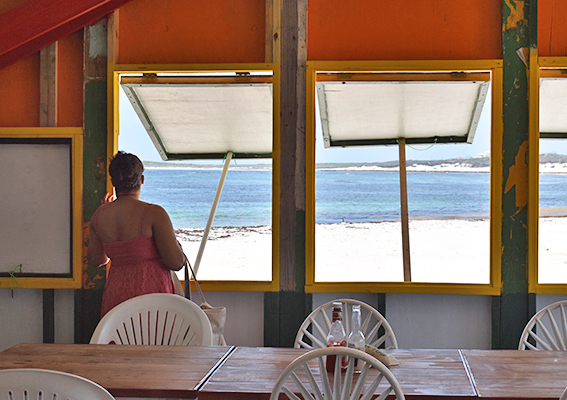 These windows display the beach picture-perfectly, as though it’s an actual painting of a tropical paradise. A mixture of blue and white cushioned seats eagerly rest under tabletops, awaiting visitors to enjoy a peaceful seaside lunch. The kitchen is easily visible from the bar area. 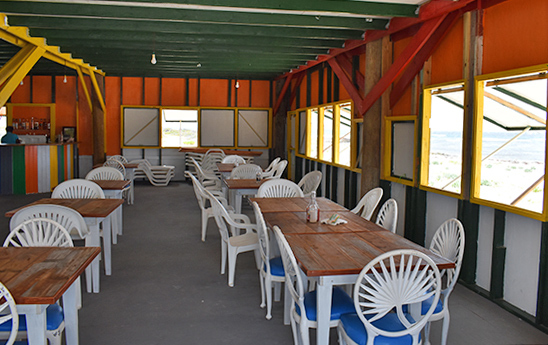 The aroma of the dishes being prepared floats through the open-air restaurant. Palm Grove Hot Sauce, A Must-Try! As Nat Approaches, Our Mouths Always Water! The yellow hind fish has become a favorite. 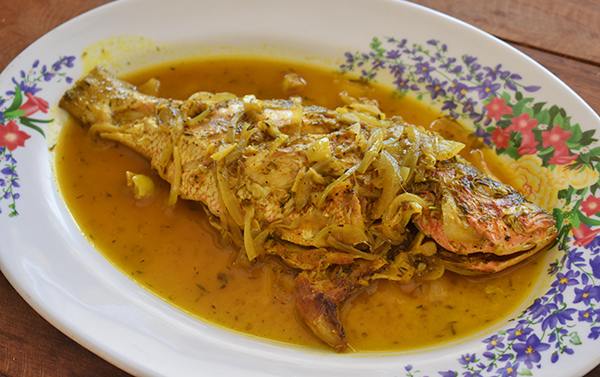 Bathed in a flavorful sauce, the fish slides off the bones so effortlessly. 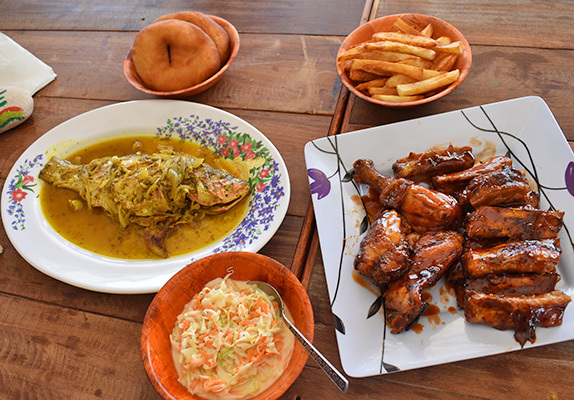 Then there is Nat's juicy BBQ, brightly complimented by crisp coleslaw and hand-cut fries. 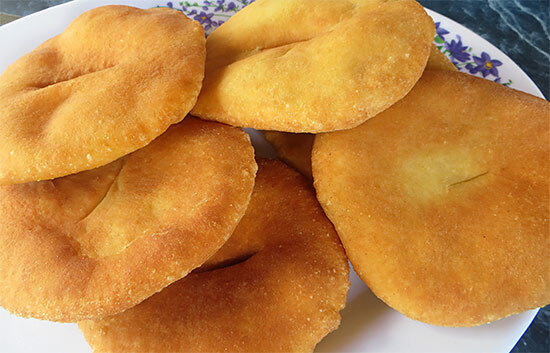 Palm Grove is also known for its famous Johnny cakes. 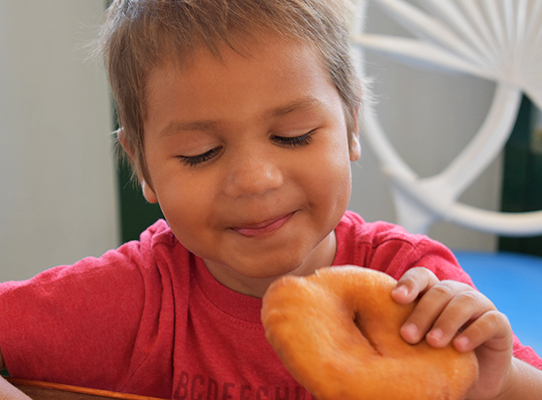 One of the best Johnny cakes on island, it's hard to not smile when you're about to bite into a Palm Grove Johnny cake! 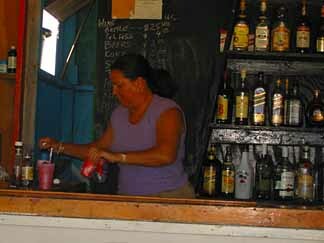 Over the years (and over several rum punches!) Nat has become a good family friend. After a meal fit for a king, my Dad and Nat talk politics for hours. (My Mom, Yuki and I meanwhile retreat into a food coma on the beach!) We have been introduced to the family, too, as his son Theon now lends a hand. Through all of the evolutions, Nat and Theon's Palm Grove has always remained the sweet, sand-swept shack we love inside and out. At the end of a long, dusty road, Palm Grove's location is dreamy. On the ever quiet and tranquil Junk's Hole (with no other buildings on the beach and no electricity! ), Palm Grove restaurant is something out of an old travel novel. 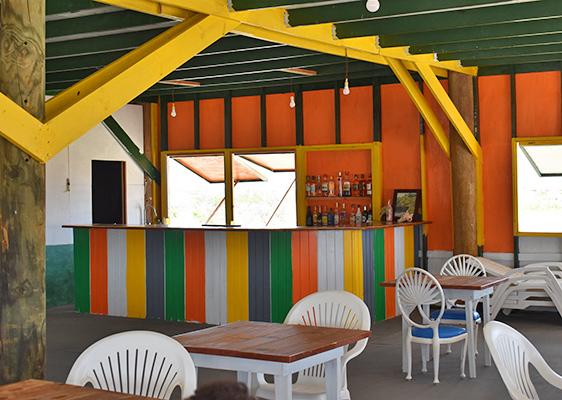 A little ramshackle of a bar serving terrific locally caught seafood and mean rum punches, and owned by the most inviting Anguillian family, it wins on all levels. Directions: If you're coming from the west, drive to the round-about in Sandy Hill (past Proctors grocery store, Best Buy supermarket and AARF). When you come to that round about, you will see two roads, take the right road. Follow that stretch. If you see the National Heritage Museum, you know you're on the right path. Continue past the museum. In a few minutes you will see a sign to Palm Grove. Follow the signs. 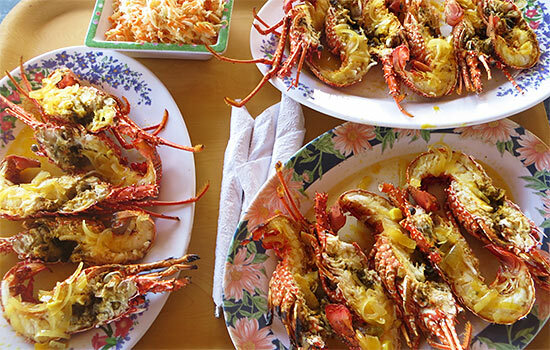 Good for a quiet beach day of grilled crayfish, hot Johnny cakes, hand-cut fries and fresh rum punches. Hours: Daily for lunch. Call ahead of time.